We're very pleased to introduce iTunesFusion! 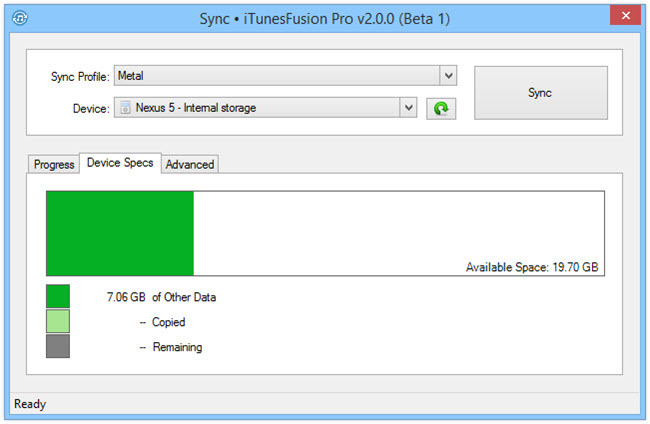 iTunesFusion was formerly known as iTunes Sync. It has been rebranded to iTunesFusion, given a complete overhaul, and we've even added some new features while we were at it. Going forward, there will be a Free version, as well as a paid Pro version. The Free version will still contain all of the features that were available in the old iTunes Sync, but the Pro version adds some new features that are quite useful! iTunesFusion is on sale for 50% off while in beta. 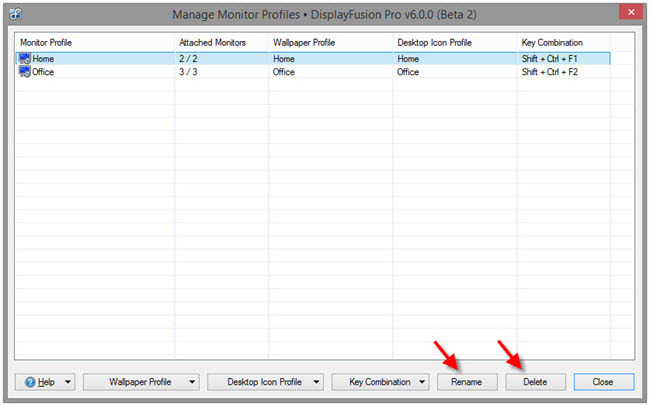 DisplayFusion Monitor Profiles store your various monitor configurations so that they can easily be loaded later on. This is an excellent feature for laptop users especially, since they may connect up to different monitor setups at home, work, or anywhere else. You can load profiles via the tray menu, the Monitor Configuration window, key combinations, TitleBar Buttons, and even via the command line! Wallpaper Profiles and Desktop Icon Profiles can also be assigned to Monitor Profiles, and will automatically get loaded when the Monitor Profile is loaded, or detected. 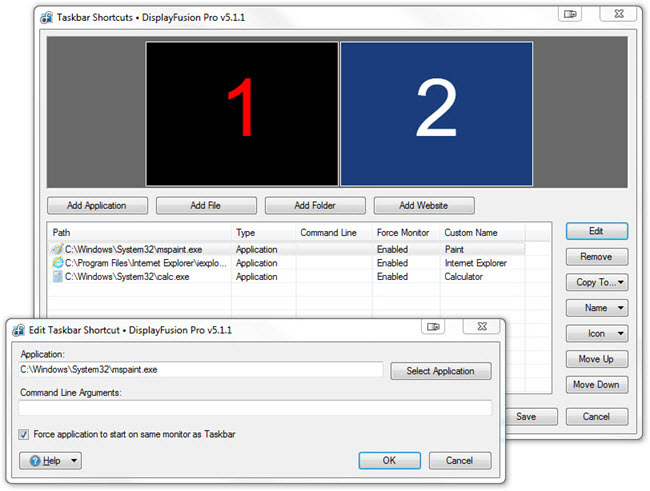 Open the DisplayFusion Monitor Configuration window. 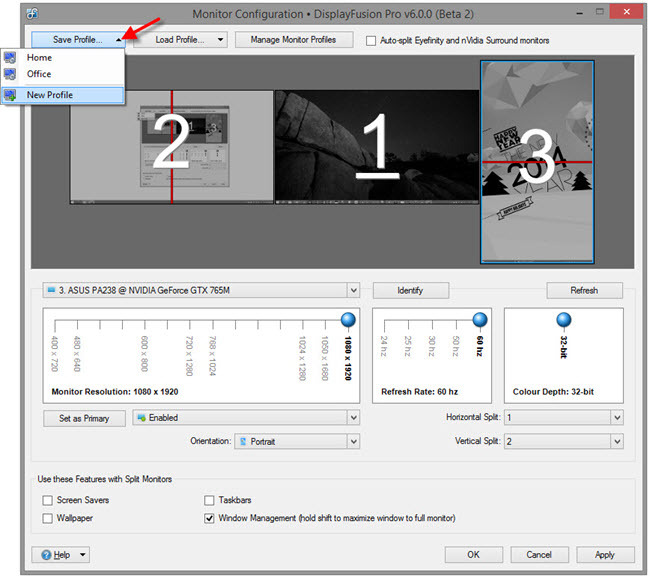 Configure your monitors and apply the settings to make sure they work. Click the "Save Profile" button and choose "New Profile." Enter a name for the Profile and click OK.
Click the "Save Profile" button, then select the Monitor Profile that you want to overwrite. Click Yes on the confirmation prompt. Click the "Manage Monitor Profiles" button. Select the Monitor Profile you'd like to rename and click the "Rename" button. Enter a new name for the Monitor Profile and click OK. Select the Monitor Profile you'd like to delete and click the "Delete" button. Select the Monitor Profile you'd like to assign a key combination to. 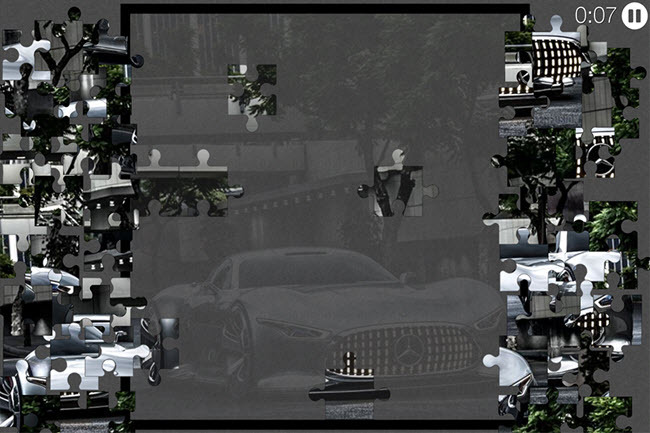 Click the "Key Combination" button and choose "Set Key Combination." 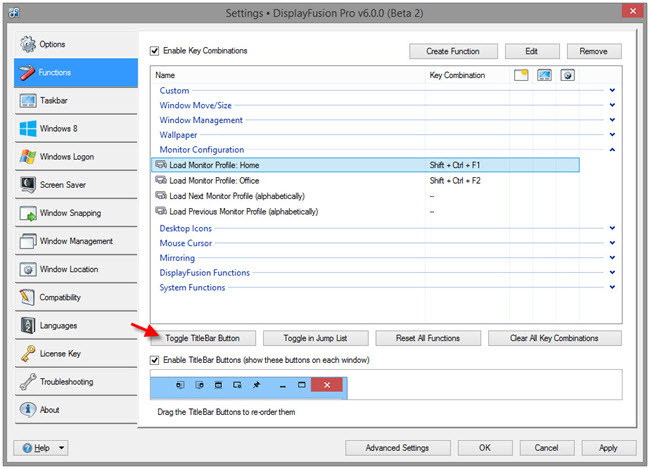 Open the DisplayFusion Settings window. On the Functions tab, scroll down in the list of Functions and select your Monitor Profile from the "Monitor Profiles" section. Click the "Toggle TitleBar Button" button, then click the "Apply" button. 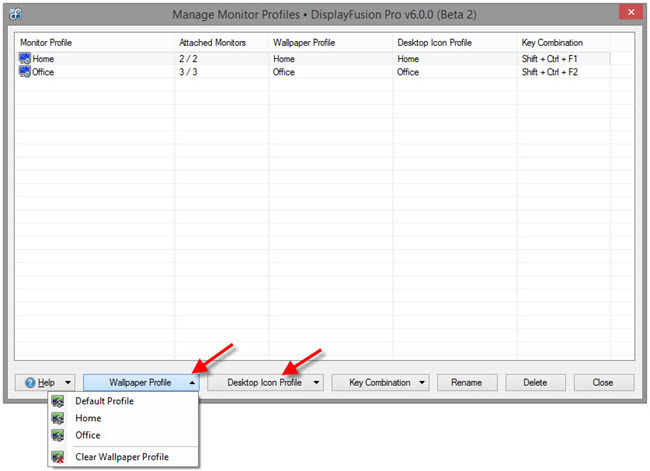 DisplayFusion can be configured to automatically load a Wallpaper Profile or Desktop Icon Profile when a specific Monitor Profile is loaded or detected. This is especially helpful if Windows moves your Desktop Icons around on restarts. 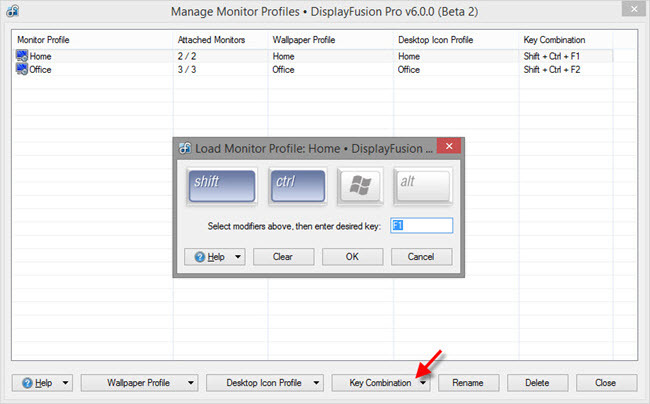 As soon as DisplayFusion starts up and detects your previously saved Monitor Profile, it will automatically load the associated Wallpaper and Desktop Icon Profiles without intervention. Select the Monitor Profile you'd like to assign a Wallpaper or Desktop Icon Profile to. Click the "Wallpaper Profile" or "Desktop Icon Profile" button, and choose the appropriate Wallpaper or Desktop Icon Profile. If you'd like to load a Monitor Profile automatically on startup, you can create a shortcut in your startup folder that will run the command in the previous section. For the full set of instructions, see the Loading a Monitor Profile on Startup How-To article. 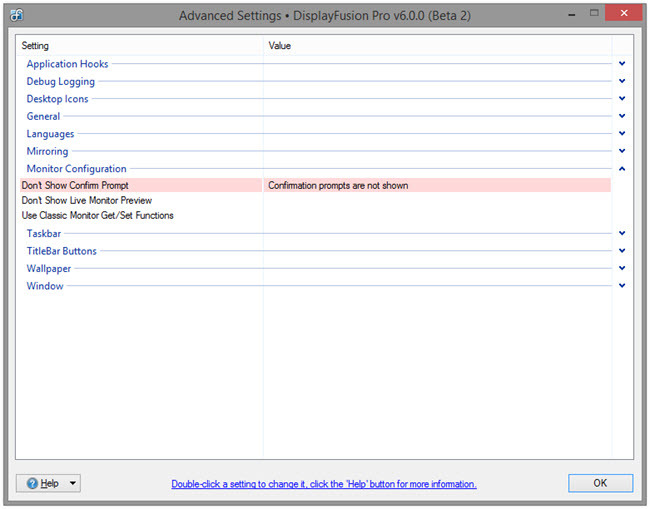 There are a few Monitor Configuration related settings in the DisplayFusion Settings > Advanced Settings window. The most useful one is the option to disable the confirmation prompt when changing monitor settings. If you switch Monitor Profiles often, you may wish to disable this prompt to make the process easier. Note: If for some reason your monitors are unusable after a settings change, DisplayFusion won't be able to revert back to the original settings if the confirmation prompt is disabled. You'd likely need to reboot your machine to make the displays usable again. Congratulations to our top contributing members for February 2014! They have been hard at work submitting, rating, and discussing images on WallpaperFusion, and have racked up some impressive reputation scores along the way! Congratulations to our top contributing members for January 2014! They have been hard at work submitting, rating, and discussing images on WallpaperFusion, and have racked up some impressive reputation scores along the way! 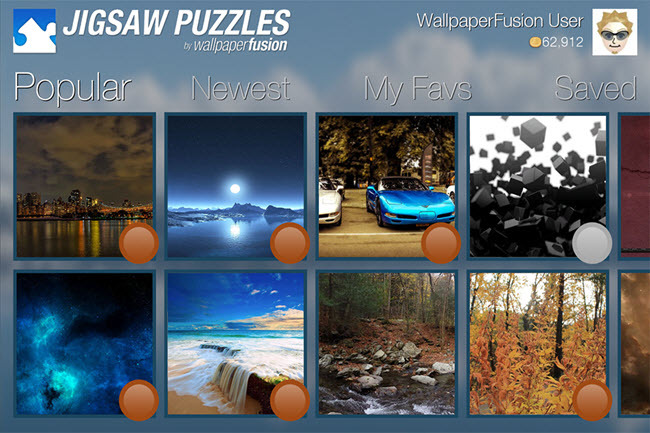 "ClipboardFusion Online" is now called "Clipboard Syncing"
Introducing Jigsaw Puzzles by WallpaperFusion! 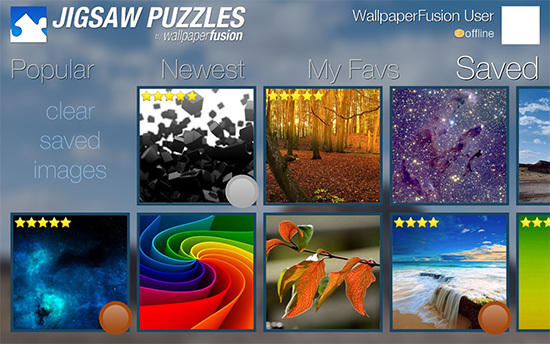 We're very excited to announce the official release of our new mobile game, Jigsaw Puzzles by WallpaperFusion. 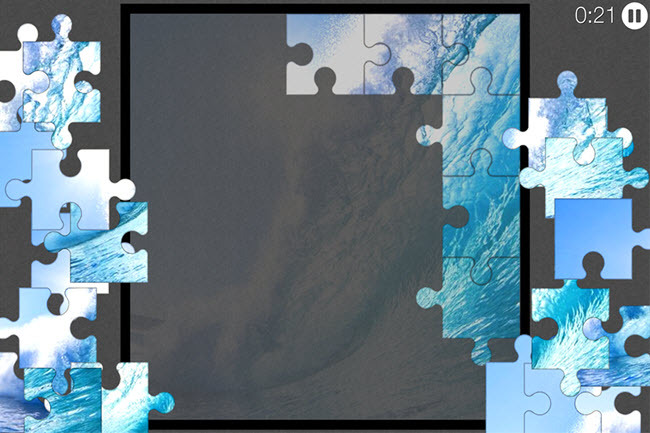 Jigsaw Puzzles by WallpaperFusion brings classic jigsaw puzzle fun to a wide variety of devices, including iOS, Android, and Windows Phone! 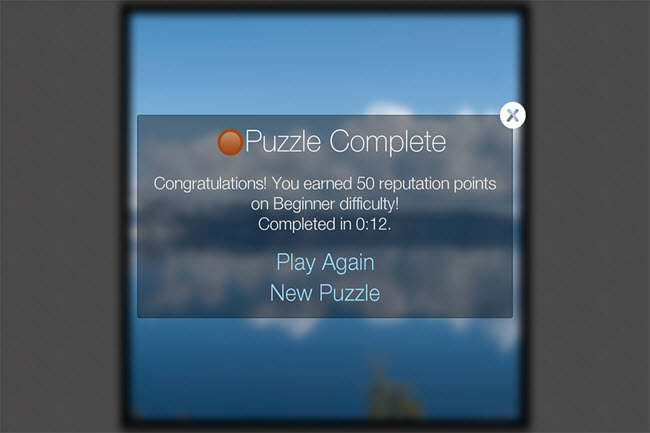 Access over 3,500 puzzle images, choose from multiple difficulty levels, save images for offline use, and much more! You can now access your account information from the top-right of each site, instead of having to login to each site's specific portal. Once you're logged in, you can access your license information by using the "My Licenses" link at the top of every page. Now when you login on one of our sites, you'll automatically be logged in to any of our other sites that you visit. No more logging in to each Discussions forum individually! We've made it easier to move between the sites for our various products, using the new product bar at the top of each site. We encourage everyone to check it out, and as always, if you have any issues, questions or feedback, please don't hesitate to contact us. We're pleased to announce that LogFusion 3.1 is now available for download! This version consists mostly of bug fixes, but also adds some new Advanced Settings as well.